History has now recorded that Russia (38½ points) won the men's competition ahead of Hungary (37 ½) and Armenia (35). In the women's competition China (29½ points) was victorious ahead of Russia (29) and Poland (28). The 35th chess Olympiad in Bled, Slovenia was the biggest hitherto and, arguably, the most successful to date. The following is an attempt to share some of what transpired in Bled from the writer's perspective. Jamaica's journey to the 35th Olympiad held in Bled, Slovenia began with the very first steps by the country's "chess ambassadors" to the Norman Manley International Airport in Kingston, Jamaica on the night of Wednesday 23rd October, 2002. There were two teams in the Jamaican contingent comprising seven men (FM Warren Elliott, recently-crowned national champion NM Shane Matthews, NM Jomo Pitterson, NM Duane Rowe, NM Robert Wheeler, candidate master Mark Smith and yours truly as non-playing captain) and four women (Maria Palmer, National Female Champion Deborah Richards, Hui Zhu and Vanessa Thomas). Before the Air Jamaica "lovebird" jet took to the air for England, there was excitement on board as a patently drunk and rowdy passenger had to be physically escorted off the aircraft. Were there to be more exciting times ahead? After a smooth flight and marvelous landing at Heathrow airport we journeyed via bus to Gatwick airport for the Air Adria flight to Slovenia. Interestingly, while passing the time in trans, members of the Zimbabwean team (including IM Robert Gwaze) joined our party. Who would have thought that Gwaze would leave such an indelible mark on the Olympiad? I should have known, however, as I recall seeing the hunger in his eyes, especially when he asked if he could play a few blitz games against us in the airport. We arrived in Slovenia about midnight local time with our Zimbabwean counterparts and had to wait a couple of hours for our visas to be processed. Our arrival was soured by the discovery that our luggage was delayed. It was extremely cold, almost sub-zero temperatures. The luggage came a day later. We checked into the Hotel Krim, a 50-year hotel with 115 rooms. In the next couple of days we discovered that there were players from many other countries also staying at there, including people from Russia, Cyprus, Yugoslavia, Barbados, Aruba and Costa Rica. Our stint at the hotel was comfortable. "For many persons it was exciting to be rubbing shoulders with all these individuals whom one would only normally see, hear or read about on the web or some other medium." The opening ceremony was held on Friday the 25th October, 2002 in the great sports hall which was to be the site for the games/matches. This was a very colourful affair highlighted, for me, by two sets of dancers, one in black and the other in white outfits. 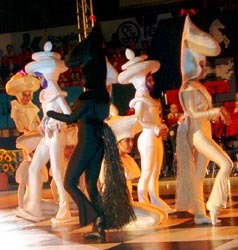 The dancers were dressed as chess pieces dancing on a floor decorated as a large chess board. Many influential persons in the chess world were present including Honorary President (and former FIDE president) Florencio Campomanes (whom I noticed during the rounds watching the games of GM Eugenio Torre and other players from the Philippines) and a number of prominent grandmasters such as Garry Kasparov, Ruslan Ponomariov, Peter Leko and Judit Polgar. For many persons it was exciting to be rubbing shoulders with all these individuals whom one would only normally see, hear or read about on the web or some other medium.